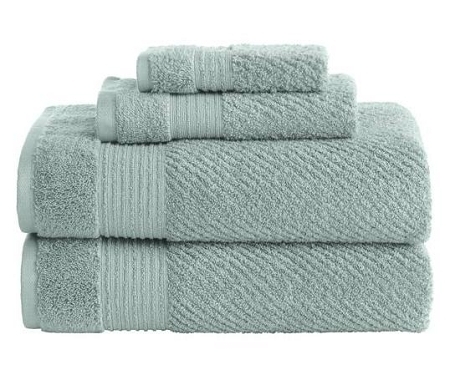 The Canopy 4pc Textured Towel Set brings you extra-absorbent towels that are 50% more absorbent than regular towels. These towels are exceptionally soft and spun from pre-shrunk yarn that allows the towel to keep its shape after you wash it.Extra-absorbent towel, Set of 2 bath towels, 1 hand towel and 1 wash towel, 100 percent cotton, Wash before use, Machine wash warm, normal cycle with mild detergent, Do not bleach, Tumble dry low, Bath towel: 30" x 54", Hand towel: 16" x 26", Wash towel: 13" x 13", Price include 1 line of print on each towell. Sets are usually embroider on increment sizes Wash cloth, .50' letter, hand towel, 1 inch letter, and bath towel 2 inch lettering.